This series of tower crane has a horizontal jib frame, a jib-trolley radius-changing mechanism and a hydraulic self-raising mechanism. It is original in design, reliable in operation and satisfactory in shape. good speed-control capacity, satisfactory operating stability and high work efficiency. Also excellent quality, International standard, reasonable cost ensure the quality of Camelway tower crane. Zhengzhou CamelWay Machinery manufacture is one of the large-scale enterprise specializing in construction machinery. The company was found in 1983. In 2000, the company passed ISO9001 Quality System certification. CamelWay Machinery manufacture develops and produces concrete mixing equipment which will satisfy your different requirements. 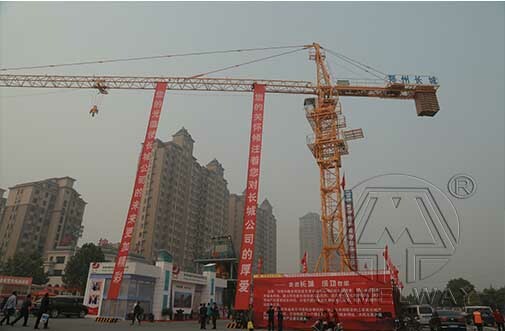 If you are interested in the tower crane or buy it, you can contact us. We will give you a reply in 24 hours.